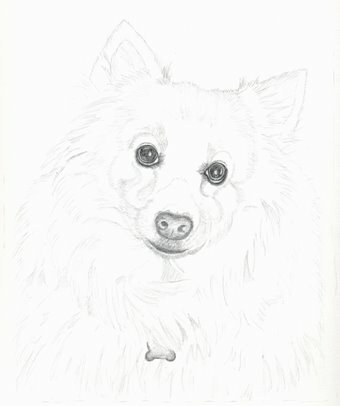 I decided to proceed with graphite in order to really get a handle on the fur, shading, etc. Once this is done, then I will have a clear idea of the pen strokes to use with pen and ink to do that version. I often find with my house portraits that I really have to have a solid pencil sketch, if not a more detailed pencil rendering, before I proceed with pen and ink. It helps to cut down on errors when I am inking. Certainly, with the longer fur here I want to make sure I have the shading and form mapped out before I go near any ink! I think the shape of the face and the fluff of the fur is coming together nicely. As you can tell, I’m working very lightly with the graphite. Once I get the shaping and form in there more clearly, then I will continue to darken where needed and it will begin to pop more.